Mississauga Councillor Jim Tovey, a dedicated champion of conservation and a long-serving member of the TRCA Board of Directors, passed away in January 2018. On August 24, the Credit Valley Conservation (CVC) Board of Directors voted to name a new conservation area in his memory. We are pleased to share the following announcement from our colleagues at CVC. The Lakeview Waterfront Connection project is a joint effort of Region of Peel, Credit Valley Conservation and Toronto and Region Conservation Authority (TRCA). Councillor Tovey’s unique connection with the Region of Peel, CVC and TRCA served to bring the organizations together to realize his vision for a thriving and environmentally sustainable waterfront. Jim Tovey discusses the Lakeview Waterfront Connection project in this Fall 2017 video, which is dedicated to his memory. Jim Tovey recognized the opportunity to reuse clean fill that was being generated by Region of Peel capital works projects as a resource to enhance the natural environment and improve the local community. This responsible reuse of material is central to the Lakeview Waterfront Connection project. The new conservation area will transform a currently degraded section of the shore into a beautiful, naturalized conservation area, expected to become a hub for waterfront recreation, a hotspot for wildlife migration and a green oasis in the heart of the city. 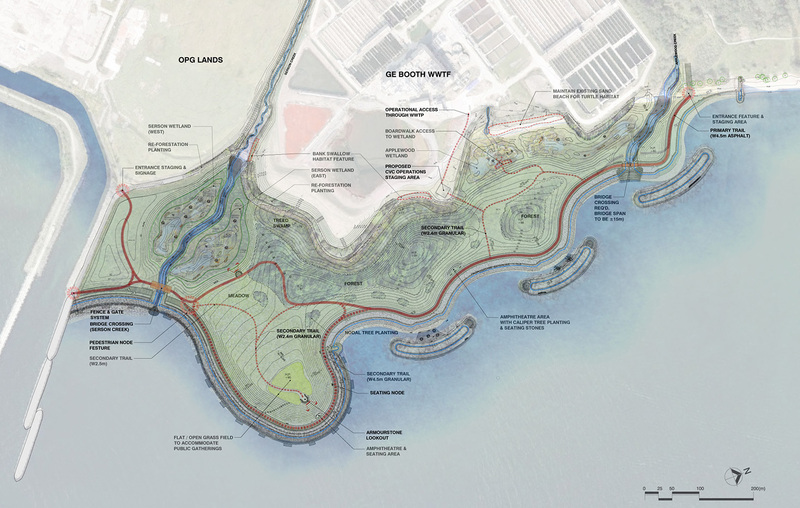 It will boast 12 hectares of meadow, five hectares of forest, eight hectares of wetland and one hectare of cobble beach. Together, these connected habitats make up a complete coastal ecosystem, approximating the waterfront ecosystem that was lost over years of urban development. This ecosystem will support a wide variety of local fish and wildlife, as well as migrating birds. The western portion of the new Serson Creek wetland has been restored. It will provide valuable fish habitat and wildlife viewing opportunities for visitors. The wetland is already attracting large flocks of Sandpiper and Killdeer, which have been onsite for the past few weeks. The project partners planted almost 1,000 native trees and shrubs last fall around the wetland pocket and are on track to start planting more than 20,000 native wetland plants during June and July. By July they plan to create a new river channel to connect Serson Creek to Lake Ontario. This will allow fish to access the creek for the first time in decades. Serson Creek is currently buried in a pipe underground. Aerial view of Lakeview Waterfront Project work in progress. The partners have reused more than 379,900 cubic metres of clean fill, the majority of which came from Region of Peel capital works projects. This keeps thousands of trucks from driving long distances to northern municipalities that accept fill, reducing greenhouse gas emissions. The public can see the new conservation area take shape from the west beach of Marie Curtis Park in Toronto. More information about the Lakeview Waterfront Connection project is available at lakeviewwaterfrontconnection.ca.